The unifying themes for the Microsoft Surface event: 8th-generation Intel Core upgrades, and black. All black. 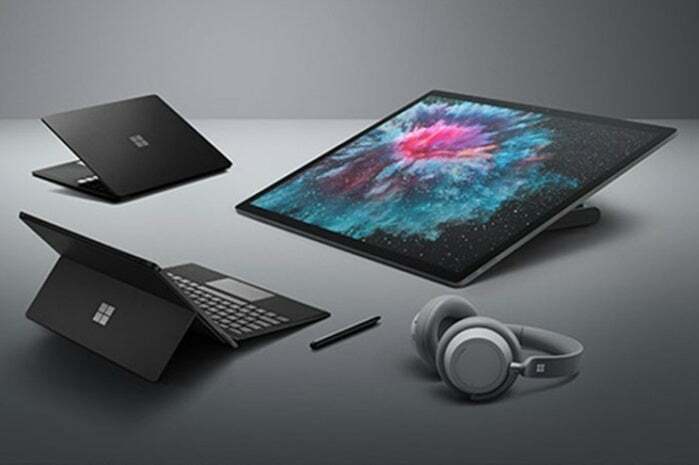 Microsoft refreshed and expanded its Surface device family on Tuesday, revealing a new Surface Pro 6, a new Surface Laptop 2, a Surface Studio 2, and even headphones. Panos Panay, chief product officer at Microsoft, introduced the updated Surfaces at an event in New York City. The unifying themes: Helping you focus. And black. All black. The event kicked off with Yusuf Mehdi, Microsoft’s corporate vice president of modern life and devices, who made an obvious assertion: We’re all pretty busy. Mehdi defined three dynamics that shape Microsoft’s strategy: Life and work are blurring; there is a constant battle for attention with digital devices; and people want to pursue their passions. “We see these opportunities and we get excited about what we can do,” Mehdi said. It starts with Surface, Mehdi said, but Microsoft also wants you to be able to interact with content anywhere, on any device, even if it’s iOS or Android. Then there’s peace of mind: Can someone be present at the dinner table? Finally, Microsoft wants to help you unlock your creativity, Mehdi said. Why this matters: Ever since Microsoft announced the press conference in early September, questions have hung in the air. A year after launching the first Surface Studio and Surface Laptop, how significantly would the company overhaul the second-generation design? Likewise, how dramatically would it revamp the Surface Pro? The answer to all of these: just enough to keep up with the times. Remember what made the original Surface Laptop so special: light weight, an optimized design, and killer battery life. (The tradeoff? Windows 10 in S Mode, though you could switch to Windows 10 Pro, too.) That’s the same premise of the latest iteration of the Surface Laptop, now with improved components. Microsoft's Surface Laptop 2, now in all black. It is incredibly quiet, Panay said, and it has a signature keyboard, with 1.5mm of key travel. Other features include Instant on and Windows Hello. The display has 3.4 million pixels, with a best-in-class contrast ratio, and the thinnest LCD on a laptop. Naturally, it has a quad-core, 8th-gen Core CPU that’s 85 percent faster than the original Surface laptop's. And yes, it ships in black. It’s still about 2.76 pounds. 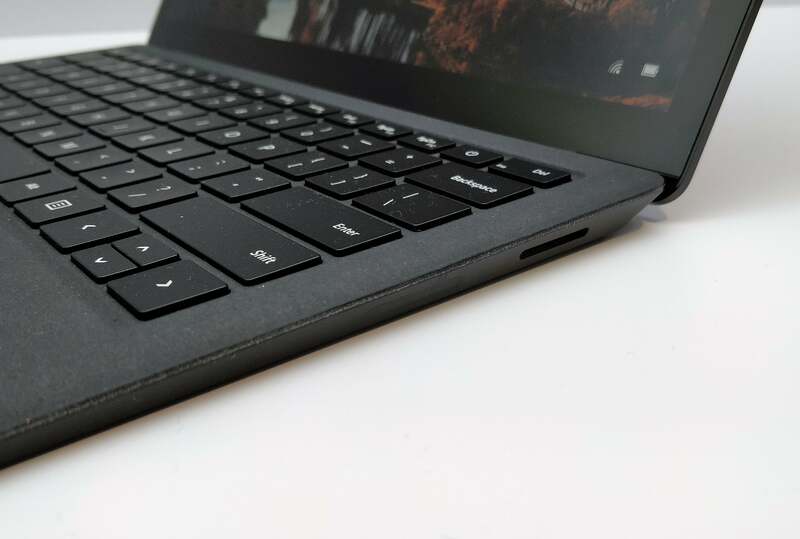 (The original Surface Laptop offered a choice of 7th-generation Core i5 and Core i7 processor, with 4GB to 16GB of RAM and 128GB to 512GB of storage. The original Surface Laptop included a 2256x1504 display with touch, a capability that Macs lacked.) Microsoft quickly listed the specs of the Surface Laptop 2, and they’re apparently similar, with up to 16GB of memory and up to 1TB of storage. 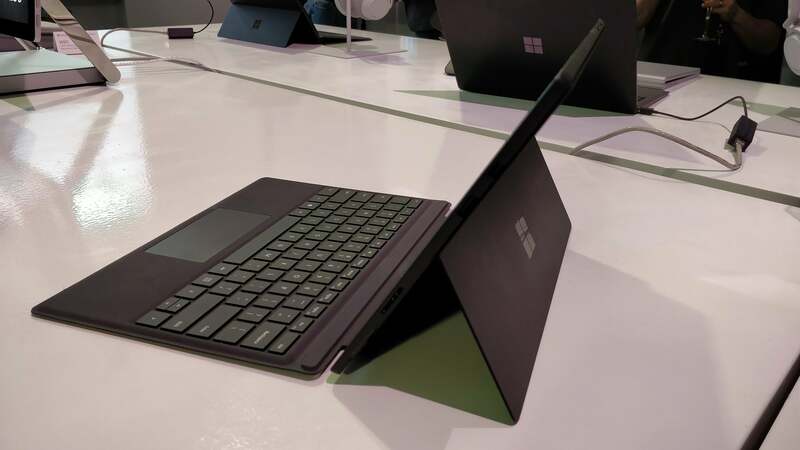 Sorry, there's no USB-C port here, just the Surface connector. Though other notebooks eventually emerged, rivaling the Surface Laptop’s long battery life, the Surface Laptop was a solid alternative to the legions of MacBook Airs that dominated college campuses. The problem, though, was its high price: $1,000 or so. The new Surface Laptop 2 will begin at $999 and ship on October 16. You can preorder now from Microsoft's StoreRemove non-product link. 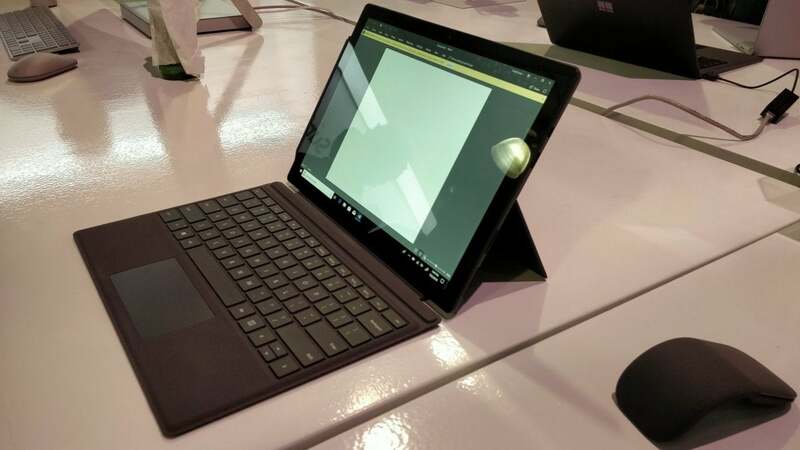 Microsoft released its last Surface Pro tablet, the Surface Pro (2017), in June of 2017. It was clearly time for an update, and that’s what Microsoft has delivered with the Surface Pro 6. While the Surface Pro (2017) featured 7th-generation Core processors inside, Microsoft has made the leap to 8th-generation quad-core Core chips for this iteration of the Surface. Naturally, a new range of optional Type Covers will follow the new Surface tablets and ship in four colors: red, blue, gray, and now black. The Surface Pen remains optional as well. Keep in mind that both accessories are added, and usually necessary, expenses for what can already be a rather pricey tablet. The Microsoft Surface Pro 6 reclines nearly fully, though you'll want to use it just partially reclined. The real concern with the Surface tablet lineup is the price. 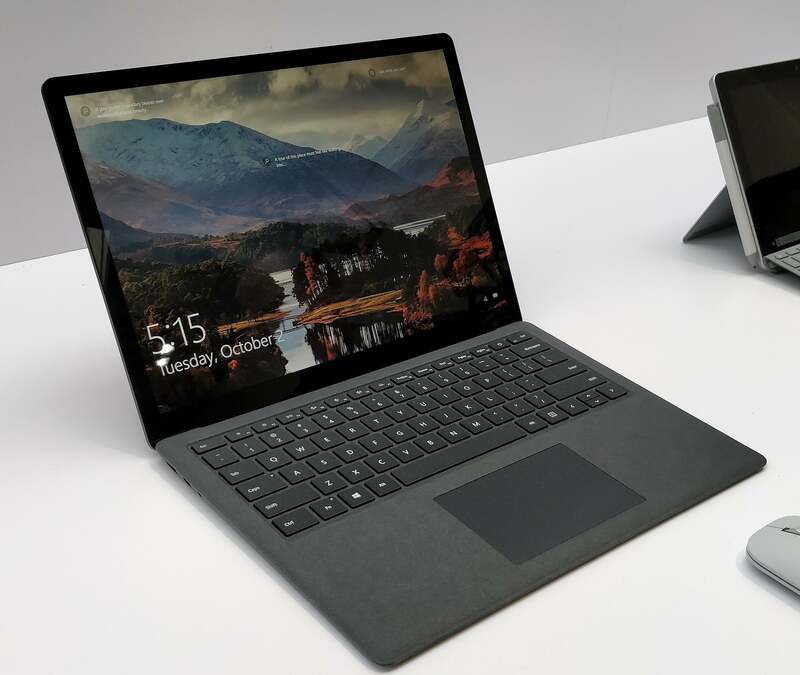 Microsoft offered the original Surface with a Core m3 CPU for $799, but prices quickly climbed to $1,300 for a Core i5 with 8B RAM/256GB of storage, and a whopping $2,799 for a tricked-out Core i7 with 1TB of storage. The Surface Pro 6 will start at $899, though we really don’t know what the upper limit will be at this point. It will ship October 16, and you can preorder some configurations now from the Microsoft StoreRemove non-product link. The original Surface Studio was a fascinating study of contrasts: a collection of mobile components that you might normally find in a laptop were instead housed in a compact desktop, itself dwarfed by a massive, swiveling 28-inch 4,500x3,000 touchscreen. At a whopping $4,100, the Studio was an aspirational device that all would covet, but few could afford. What could Microsoft do for an encore? The Surface Studio 2. Microsoft's Surface Studio 2 is still the all-in-one you'll dream of owning. Microsoft went to a new display design that uses a different transistor, with a smaller pixel but a greater aperture. With the new LCD material, Microsoft was able to better align the LCD to the polarizer, giving it 22 percent more contrast and 38 percent greater brightness—over 500 nits of total luminance. While the original Surface Studio used a number of mobile components, they approximated desktop power. There was a 2.7GHz Intel Core i7-6820HQ and Nvidia’s GeForce GTX 980M 4GB GPU, plus a whopping 32GB of memory, a massive 2TB hard drive, and a 128GB SSD for caching. For the Surface Studio 2, you might think that Microsoft has moved up to 8th-gen quad-core Core i7 CPUs, but it hasn't: there's a 7th-generation Core i7-7820HQ instead. In addition, it uses older Nvidia Pascal graphics, specifically the GTX 1070 and 1080 parts. But oh, what storage! It has a 2TB SSD, ditching the first Studio's hybrid drive entirely. Game console or PC? Who cares? 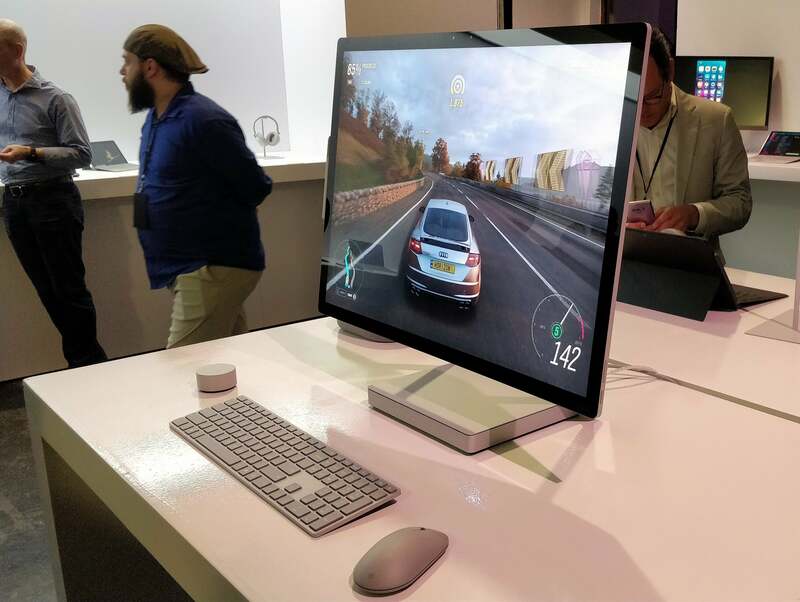 The Surface Studio 2 now has the horsepower for either artists or gamers, Microsoft says. Panay talked up the accompanying Surface Pen, with 4,096 levels of pressure and best-in-class ink latency. Panay also showed translation from inking to text. The Surface Studio will ship by November 15 with a starting price of $3,499. You can preorder it now from the Microsoft StoreRemove non-product link. Unfortunately, the imminent Windows 10 October 2018 Update never had a formal coming-out party. Members of the Windows Insider beta program have already had a chance to test out its new features and improvements. The assumption was that Microsoft has already released the final Insider build in preparation for a final release to consumers at large. Mehdi gave a short overview of the October 2018 Update’s highlights: Timeline, Your Phone, and more. (PCWorld's review is coming soon.) But the real news is that the October 2018 is live: You can download it now, Mehdi said. Microsoft showed off one new feature that the company already announced: integrating to-do’s within Outlook. The To Do app is also being integrated within the Microsoft Launcher app for Android, a capability Microsoft previously said would be coming soon. For the future, Microsoft showed off My Phone with apps. You’ll be able to mirror your phone on your PC, so you can actually use those apps right within your PC environment. Now that Windows is a service, rather than a series of individual product releases, development continues. The Windows team is busy working on the expected spring 2019 update to Windows 10, now dubbed “19H1”—at least internally at Microsoft. 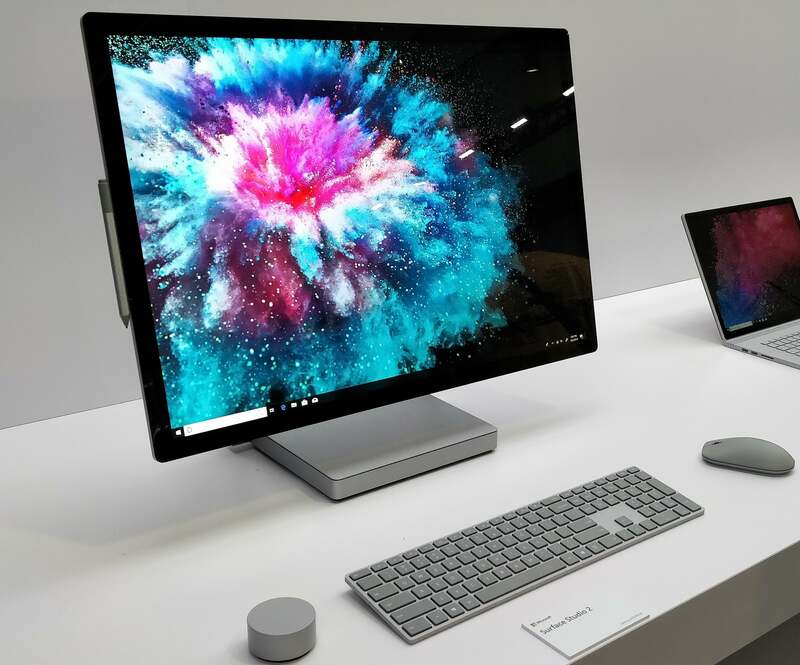 Microsoft has readily marketed peripherals to go along with its Surface products, including the Surface Pen and various iterations of Microsoft mice, like the well-made Surface Precision Mouse. 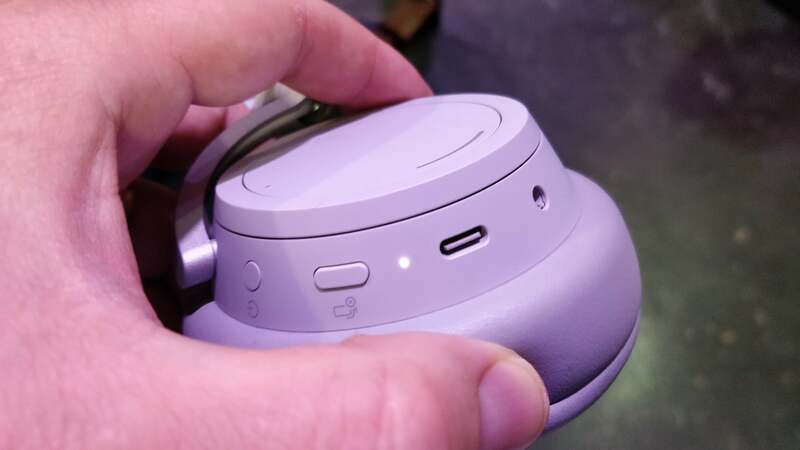 At the New York event Tuesday, Panay introduced something new and unexpected: headphones. Meet the Microsoft Surface Headphones. It’s an odd, but not totally unexpected choice. With more and more people traveling for work with Surface and other devices, the potential for the outside world to intrude grows. Whether it be a coffee shop or airline flight, ambient noise can make it more difficult to zero in on the task at hand. 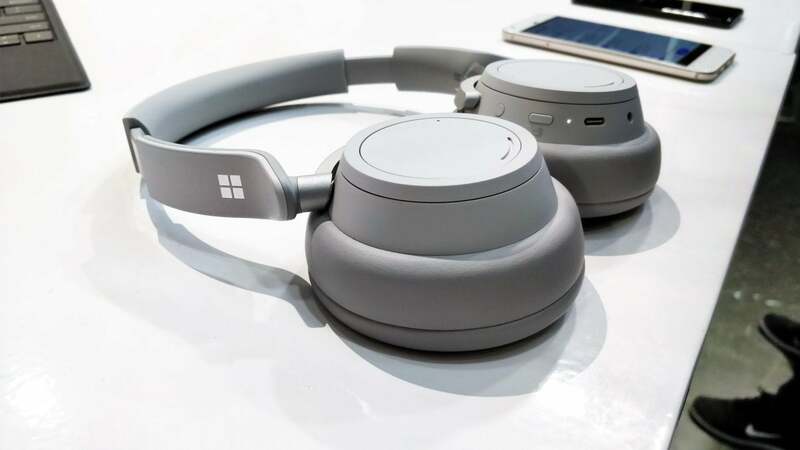 The new Surface Headphones help eliminate ambient noise through active cancellation, with 13 levels. It has 40mm drivers, four beam-forming mics, and and four active noise-cancelling mics, too. Naturally, the headphones are also Cortana-powered. They’re coming soon, and information is already available at the Microsoft Store, but preorders haven't opened yet. Microsoft's Surface Headphones use USB-C for charging. There's also a mute button for when you want to talk without Cortana hearing you. Finally, in a blink-and-you'll-miss-it moment, Panay unveiled Microsoft Surface All Access, described as “all the Surface you want for $24.99 per month.” Is this a leasing program? Panay didn’t explain. Check out the Surface blog post for more information. Correction: The Surface Studio 2 uses an Intel 7th-generation Core chip inside of it. An earlier version of this story also misstated the weight of the Surface Laptop 2.